The Workflow Landing Pane provides all actions available for a Workflow. Opens the Run Now Pane for the Workflow to enable a user to run the Workflow on-demand. Toggles Always On mode which enables a Workflow that commences with a Trigger to run continuously. 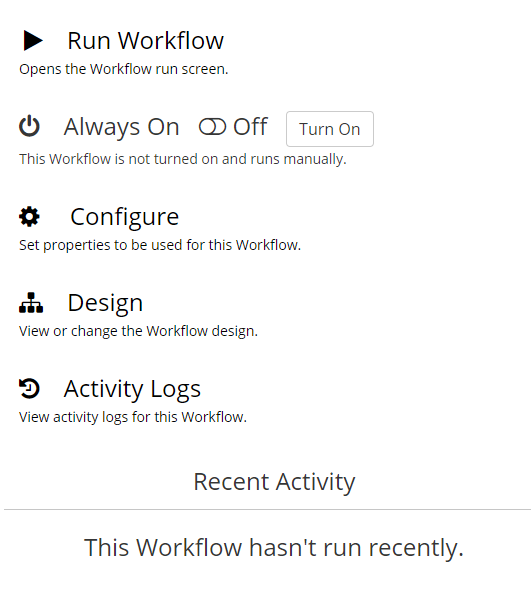 Opens the Configure Workflow Pane where persistent settings for a Workflow can be updated. This option only shows when at least one Configuration Property is present in the Workflow. Opens the Workflow Design Pane. Opens the Activity Log Pane, scoped to the current Workflow. Shows the 10 most recent executions of the Workflow in the past seven days.